The return of hidden gags. The ability to build and launch rockets. Comments: This is by far the best of the Farm Frenzy series. 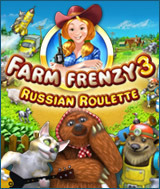 The Farm Frenzy games are very addictive to me. The story and graphics are great. There are several levels that are extremely hard but you can get gold in all of them. Comments: Great graphics, story line and music. It is a well thought up game. I like and have played all in the Farm Frenzy series and love them all.